Beautiful work, Debra, and a nice change from the usual orange pumpkins. Gorgeous insides!! Wonderful work, Debra!! Gorgeous! and I've never seen a green pumpkin! Good to hear you have been busy working. These pumpkins are great, perfect as always. Love you drawing - lovely! I live in hong kong too, for a couple of years now. Glad to hear from someone living in the same city. Keep us update with you nice works! 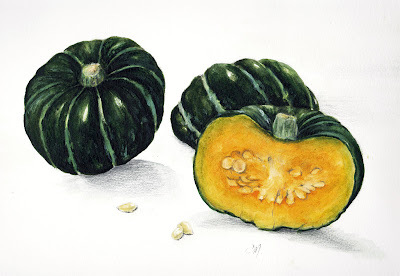 I agree, its nice to see something different in the same subject, the only greens once I can find here are the butter nut squash. I like it that you had one cut in half. Beautiful work as always!! I was going to say the same thing as Bella! So, yes, great work, lovely colors! So realistic, I could eat them! Wonderful as always - those seeds amaze me! I miss these green pumpkins =) I was just thinking about them the other days when I was looking at those bright orange ones here, and thought that it'd be pretty cool to carve one of those green ones. I love these! I don't think they need a background. Maybe you could add a bit of the green in the shadows? It's probably there, but doesn't show up on my screen! I absolutely love your lemons and seed pods too! awesome, your baby pumpkins look so cheeky and playful. the zazzle stuff looks great too. good luck with it all. They look great as they are!